This year’s State of the Union speech opened what will likely prove to be an overly long 2020 presidential campaign. Investors will need to focus on democratic challengers and their platforms. As the candidates’ views become more familiar, investors will make judgments on how their proposals may affect the economy and industries as well as, very importantly, their own personal circumstances. With that, this commentary briefly outlines some tax proposals and their likely impact based on past results. A treat investors can look forward to will be the first presidential debate in June – a great way to start the summer. 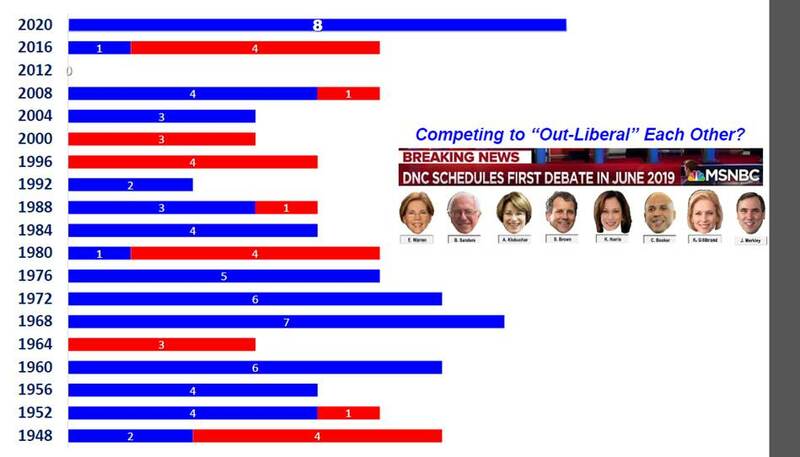 This debate will give investors their first chance to sample democratic presidential candidates. A record number of candidates come from the senate (see figure 1). At this first debate, investors may get a sense how far left various democratic candidates moved to appeal to their democratic base. Guess who is popular in the house? Representative Alexandria Ocasio-Cortez’ popularity and positions underlye. Democratic movement to the political left. Figure 2 uses one measure to compare her popularity to the senior citizens of the democratic house leadership. That figure provides evidence of her rapid growth in popularity. The growing income/wealth dichotomy in this country led to important new tax proposals from the democratic candidates. Raising the highest marginal personal income tax rate to 70% represents the key proposal from many of these candidates. 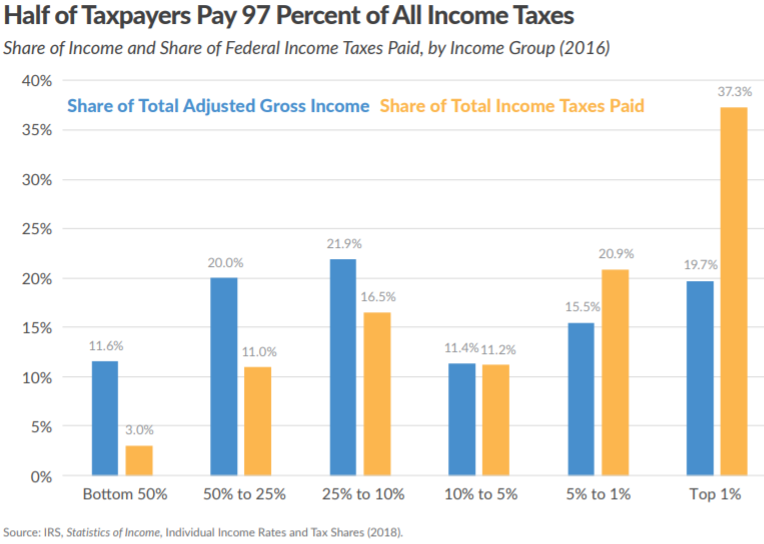 Figure 3 shows the share of both income and federal taxes paid in 2016 by income strata. Judging tax fairness will vary based on an individuals economic, political, and social views. Historically, measured as a percent of GDP, the tax take stays fairly stable (see figure 4.) This stability occurred despite varying top marginal tax rates. Prior to the 1986 tax code revision, many individual business owners avoided higher personal tax rates by organizing themselves as corporations. By doing so, they took advantage of much lower corporate tax rates. In addition, before the tax code revisions, many more deductions existed that reduced taxable incomes. Bottomline, earlier tax regulations provided many ways to legally avoid the higher top tax rates. 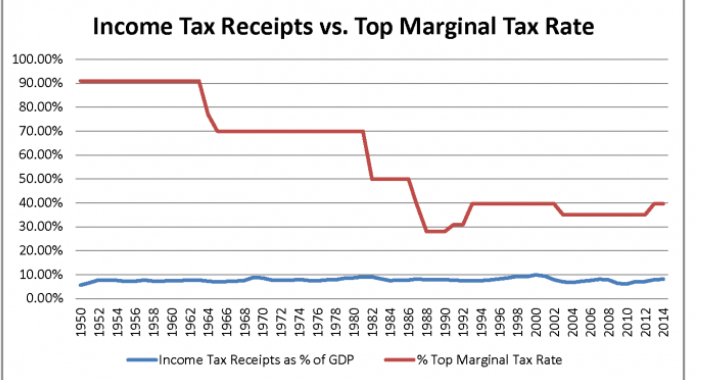 In 1986, congress passed a revised tax code significantly lowering personal tax rates. At the same time, this revised tax code either eliminated many past deductions or put a ceiling on them. As a result, after the 1986 tax code revision, many individual business owners shifted from corporate to personal tax reporting. One of the candidates seeking the democratic presidential nomination proposes a wealth tax. She would initiate a 2% wealth tax starting at $50 million of household wealth then increase it to 3% for $1 billion of wealth and above. The proposed wealth tax would apply to roughly 75,000 u.s. households. For perspective, today only four developed countries tax wealth compared to twelve countries in 1992. Most recently, President Macron eliminated the French solidarity wealth tax – the ISF. The declining number of countries employing this tax suggest wealth taxes did not meet their revenue and social goals and proved difficult to enforce. 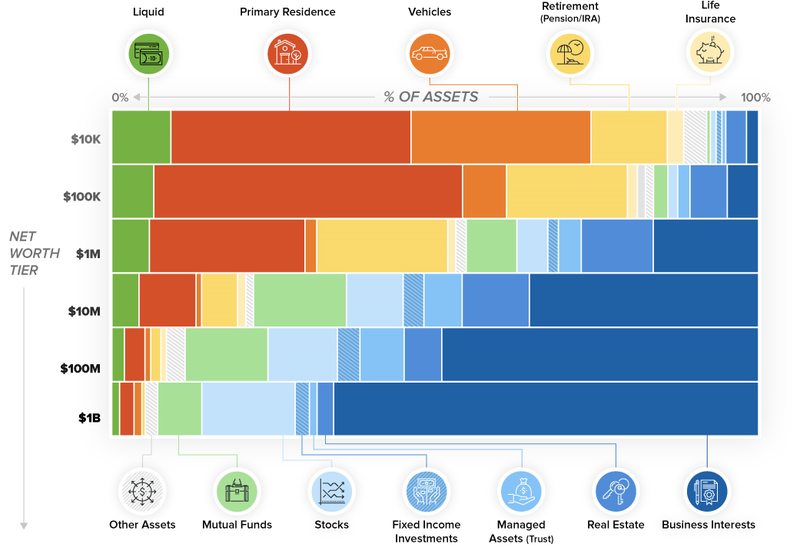 To provide some perspective, figure 10 shows asset mix by varying net worth levels. As that figure shows, the most likely to be taxed wealth resides in businesses – in many cases private. That form would makes it difficult to determine private business value on an annual basis. It may seem premature to be looking at next year’s presidential election but remember the Iowa caucus will occur early next February. Presidential elections provide the mothers milk fueling politicians in Washington. With a large number of democratic senators out campaigning with conflicting platforms, it seems likely little ground breaking legislation will come out of Washington this year. For example, businesses and investors looking for infrastructure legislation may be disappointed. Finally, no doubt investors will likely see major tax policy differences between the incumbent and the democratic nominee. Let the game begin.